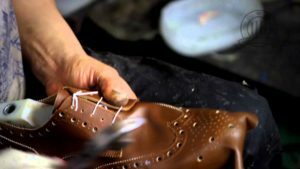 standard-title Men Shoes Designs The pattern-cutter begins by covering the last with an adhesive canvas on which our artisans will draw the model. This adhesive material will then be peeled off and the model reproduced on a cardboard pattern. From this pattern the cutter will cut the pieces of leather that will form the shoe’s upper. These pieces will then be pared, assembled and stitched by the specialist craftsman. The pattern-cutter begins by covering the last with an adhesive canvas on which our artisans will draw the model. This adhesive material will then be peeled off and the model reproduced on a cardboard pattern. From this pattern the cutter will cut the pieces of leather that will form the shoe’s upper. These pieces will then be pared, assembled and stitched by the specialist craftsman. In a world where guys wear flip-flops to work and can barely remember how to knot a necktie, it’s the perfectly put-together man who’s cooler than the rest. Just because the workplace has gone casual doesn’t mean you have to look like every other drone in theoffice—in shapeless pants and oversize dress shirts. There are many different designs of men shoes, to let you stand out in the boardroom.